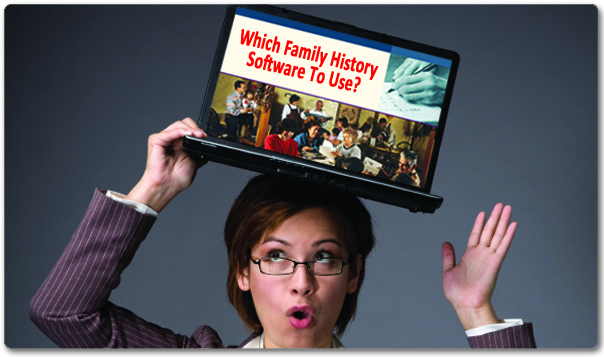 Which Family History Software Program Should You Use? There are three main family history software programs to choose from. They all have a free version (which syncs with FamilyTree) and a deluxe version (which does more and costs a few bucks). A family history software program helps you organize your records on your home computer. 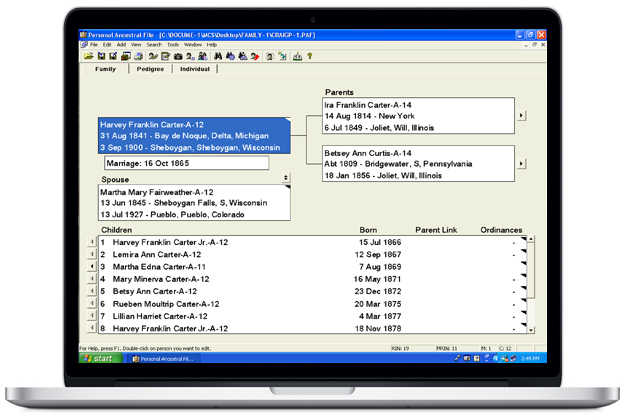 It lets you record all the same basic information that FamilyTree does — and gives you the added benefit of full pedigree charts (FamilyTree only prints a single page 4-generation pedigree chart), book formats and publishing, color coding, wallcharts, ancestor and descendant lists, online publishing, and more! Plus, no one can get in and mess up your family history. 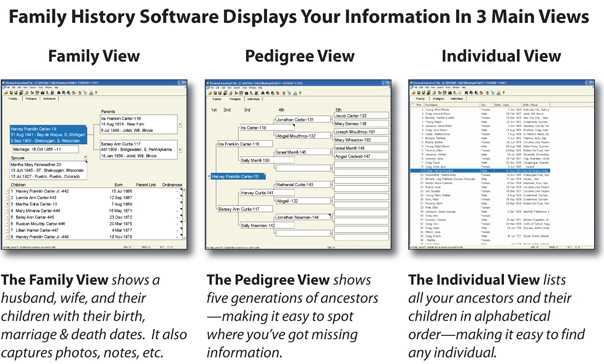 These are the three main software programs that sync beautifully with FamilyTree. Each one is excellent. And they each have a free version (plus a deluxe version with lots of great extra features that you pay for). The easiest way to decide is to go to their websites and look at the screen shots that show what they look like — or, better yet, download their free versions and give them a test drive! From their Website: Ancestral Quest is the easy-to-use, full-featured family tree program which received the “Most Comprehensive Syncing” award from FamilyTree. PAF was created from an earlier version of AQ, so PAF users will feel right at home using the screens, reports, and other functions. AQ includes an Ordinance Reservation and Tracking System, which helps users keep their personal data in sync with temple records. Ancestral Quest is the ideal program to help you organize your family tree. From their Website: Legacy Family Tree is the free genealogy software to organize, research, and publish your family’s tree. Use Legacy to print maps, get research suggestions, collaborate with other family members, cite your sources, publish books and shareable CDs and much more. Legacy makes it easy to work with FamilyTree and will measure your progress against the goals you set for temple work and more. Easily import from PAF and other programs. Get started today by downloading Legacy for free. From their Website: Winner of the FamilyTree award for “Easiest to Sync”, RootsMagic genealogy software makes working with FamilyTree a breeze, including reserving ordinances and creating temple trips. Import directly from PAF, FamilyTree, and other programs. Take advantage of other features like running RootsMagic directly from a USB drive, SourceWizard, integrated web search, and much more. Whether you’re a beginner or an experienced genealogist, RootsMagic makes family history easy. 1. You can use any of the above three programs on your Mac by using a PC emulator such as Parallels or VMware Fusion. They each work fine. 2. Or, use MacFamilyTree — it’s presently the only Mac program that syncs with FamilyTree. It’s not free, but you can download a demo that lets you play with it. 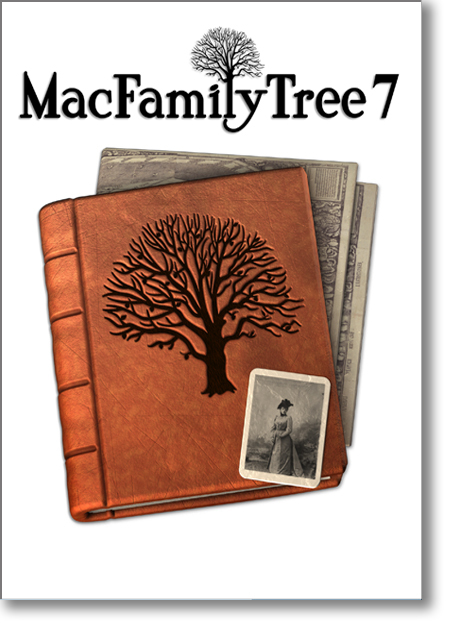 From their Website: MacFamilyTree is modern, interactive, incredibly fast and easy to use. It comes with countless features to record and visualize your family history — use it to create reports, charts or nifty 3D views within our Virtual Tree feature. Synchronize your data via iCloud, create web pages or back your research with the help of the gigantic FamilySearch database. On the go? No problem! MacFamilyTree’s iCloud feature automatically synchronizes the data on your Mac with your mobile devices such as the iPhone, iPod touch and iPad. For a comparison of all the top Mac family history software (even though most don’t sync with FamilyTree), visit this site. Want to sync with your phone, iPod or iPad? 1. Visit the websites of the software programs shown above to determine if they’ll sync with your particular mobile device. You can also visit the FamilySearch software partner site (click on “Mobile” in the navigation on the left side of the page). 2. Or, use MobileFamilyTree — it’s a mobile program that syncs iOS devices with FamilyTree. 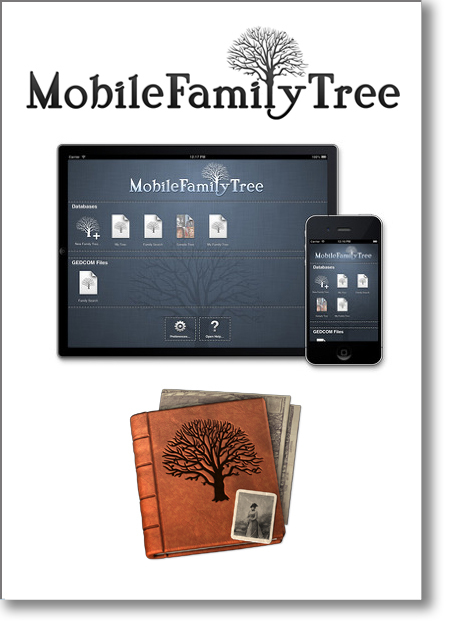 From their Website: MobileFamilyTree 7 is the first full-featured mobile genealogy app for iPhone, iPad and iPod touch. It comes with all the features you’d expect from a modern genealogy application, provides you with everything you need for genealogical research and works like a charm – without a Mac or PC! Exchange GEDCOM files with other genealogists share your family tree by e-mail or synchronize your data with other iOS devices or Macs using iCloud. MobileFamilyTree 7 is based on the same architecture as MacFamilyTree 7 and offers all charts and reports available in MacFamilyTree, making it the only mobile app of its kind and therefore unrivaled! Okay, now let’s move on!